The Nigerian Air Force has published the timetable for the 2016 Zonal Recruitment Screening Exercise. The examination is scheduled to hold from Monday, 11th to Friday, 29th April, 2016 at 13 Centres nationwide. All applicants are to come to the Centres ONLY on their scheduled days. (a) Evidence of text message received from NAF DRRR. (c) Original certificates of NECO, WASC, NABTECH, ND as applicable, Trade test 3,2,1 as applicable, NCE as applicable. On Saturday 23 April 2016 (day slated for the Aptitude Test) all applicants are to come along with only their letters of invitation, Acknowledgement Cards, HB Pencil and Eraser from 8 am. The Aptitude Test starts at 12 noon in all the Centres and ends at 1 pm. 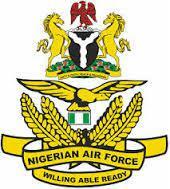 1 Response to "2016 Nigerian Air Force Zonal Recruitment Screening Exam Timetable"